Photo credit: US Navy Mass Communication Specialist 3rd Class Dylan McCord, 3/18/2011. Creative Commons. Much has been said of the impact of the March, 2011 earthquake and tsunami that struck Japan, as well as the consequent disaster at the Fukushima Daiichi Nuclear Power Station. The event wrought massive destruction and caused upwards of 15,000 casualties. Many affected cities and towns still have not recovered, almost three years later. Ruth, in A Tale for the Time Being, worries that her invisible correspondent-through-the-ages, 16 year old Nao, has met her fate in the tsunami; Ruth's fears were echoed, and are still echoed, by people across the world whose friends and family were in Japan at the time of the disaster. 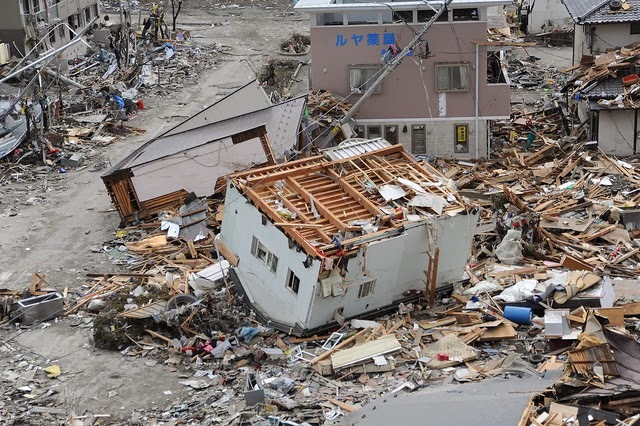 According to the National Police Agency of Japan, 2,640 people across the country are still missing and unaccounted for. Photo credit: Petty Officer First Class Matthew Bradley, US Navy, 3/15/2011. Creative Commons. Less has been said, however, about the harm done to Japan's social and spiritual life. As Richard Lloyd Parry points out in his recent essay "Ghosts of the Tsunami," Japanese culture traditionally focuses on the spirits of dead ancestors, who often play a relatively active role in the spiritual life of a family or an individual. With so many dead in one fell swoop, what happens to those who are left alive? And what happens to the spirits? "I met a priest in the north of Japan who exorcised the spirits of people who had drowned in the tsunami," begins Lloyd Parry's essay, and from there he embarks on a journey through Japan's spiritual landscape, which was no less shaken by the tsunami than the buildings and houses and streets. Between dead ancestors with no one to care for them and survivors forced to leave their ancestors behind as they fled their homes exists an ocean of grief. "Ghosts of the Tsunami" attempts to navigate this ocean. You can read Richard Lloyd Parry's "Ghosts of the Tsunami" here on the London Review of Books website. As a reminder, we are still accepting nominations for the 2014-25 Go Big Read selection. Our theme this year is "service," and you can read more here about what we're looking for. If you have a book in mind that might fit the theme, let us know. The nomination deadline is February 1st, so hurry! 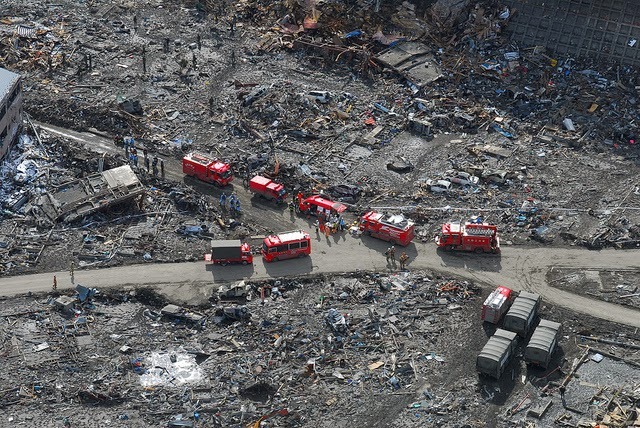 Alway, pictures of tsunami are heart breaking. We have it also in our country Indonesia on 2004 nearly 10 years ago. But still, it bring me to tears when I look these pictures. Stunning yet heart breaking. It's so sad to think that many people died during the tsunami last 2011. It's so heart breaking. The top picture reminded me of Ground Zero where the Twin Towers stood. This looks like the cleanup zone.